Have you ever wanted to soar the clear, blue skies with the eagles? Click here to play! Now is your chance! 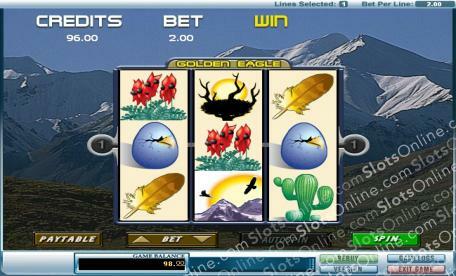 Live the life of an eagle and you could walk away from this adventure with plenty of cash prizes! You'll need to learn to be an eagle from the eagles, so keep a close eye on the Bald Eagle. This majestic creature acts as a wild symbol and will replace all other symbols to help you create more wins. It only appears on reel 2 but will double your prize if he helps create a winning line. Spin one two or three chipmunks and you'll get 1, 20 or 1000 times your line bet respectively. Rabbits will get you up to 250 times your line bet. Don't forget to watch over your eggs while you're living the eagle life. Two or three red eggs will get you up to 100 times your line bet. Green ones bring in up to 50 times and blue ones bring in up to 25. There are a few other symbols you'll need to spin in order to survive, including your nest, cactus, features, plants, plus more. See if you can cut it as an eagle flying through the skies. Spin the reels of this 3 reel game and you could see yourself flying high with plenty of big wins! The Bald Eagle acts as a wild symbol. He only appears on reel 2 but will substitute for all other symbols to help you create more wins. He also doubles your prize money if he appears in a winning line.